Scientists in New Zealand have confirmed that two spade-toothed beaked whales, the rarest species in its family, had been found on one of its beaches. 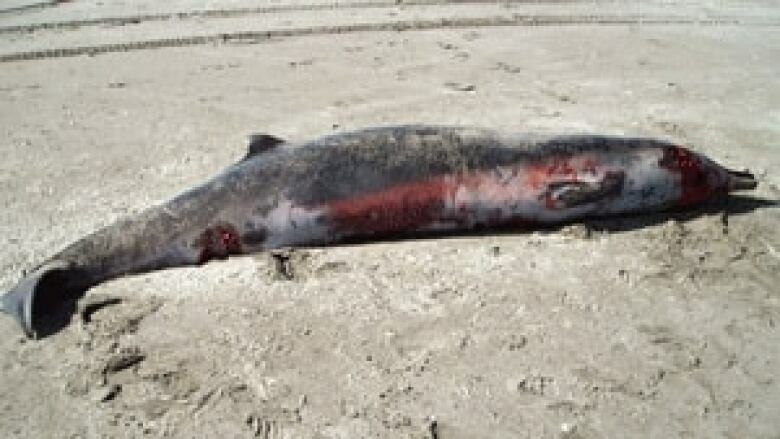 It would mean they are the only whole spade-tooth beaked whales that have ever been found in the world. "For the first time, we have a description of the world’s rarest and perhaps most enigmatic marine mammal," said the report. Until now, no one knew what the whale actually looked like. Back in 1872, a jaw bone with teeth from a male was found in the Chatham Islands southeast of New Zealand.Then, in the 1950s, one skull — without the jaw —was found in the same area as the most recent discovery and another skull was uncovered on Robinson Crusoe Island off the coast of Chile in 1986. The five-metre female whale was discovered on Opape Beach on the country’s North Island on Dec. 31, 2010 along with her 3.5-metre male calf. Conservation workers took tissue samples and photos before burying the pair under the sand. Six months later, scientists at the University of Auckland tested the samples and made the discovery. "We were pretty stunned," said Rochelle Constantine, senior lecturer in biology at the University of Auckland and co-author of the paper, who was with her colleague Kirsten Thompson when the results came in. Constantine says scientists know almost nothing about the spade-tooth. Researchers returned to Opape Beach this year to unearth the skeletons. Beaked whales belong to the family Ziphiidae, which has 21 species of toothed whales, all with distinctive elongated beaks. Spade-toothed beaked whales live in the South Pacific Ocean, a vast area spanning more than 85 million square kilometres, with some of the planet’s deepest oceanic trenches.